In recent weeks I’ve been telling you about The Aquabats and their quest to revive their Aquabats Super Show (HERE and HERE), and I’ve also posted the video chapters of their quest to reunite the band. Well, the Kickstarter campaign has been rebooted so that it can be extended to September 29. All previous pledges were cancelled and new pledges are being made. The band has also adjusted the goals and rewards, so that you can get REAL OBJECTS™ at lower levels, and now they don’t have to raise a million dollars to make anything happen. The previous campaign was in its last week, and had just topped $600,000. That was impressive, but they’d set their sights too high. In less than a day, the new campaign has already brought in nearly a quarter million, so this seems like a really wise move. They’ve already raised enough to record a new album and make six more mini-episodes of the show, just in the first eight hours (as your PopCulteer writes this). Today I’m going to bring you the latest three (or four) installments of their reunion adventure, and you just saw the new Kickstarter widget above this to bring you up to date on how much money they’ve raised. Click the links in the first paragraph to see all the previous chapters of this gripping saga. Watch MC Bat Commander skillfully reboot the campaign while cracking an in-joke about how much the previous one raised. See how the band tracks down Eaglebones and fights Powdered Milk Man, and then find Ricky selling fruit at the beach. Will they find Crash, and can he save the day? 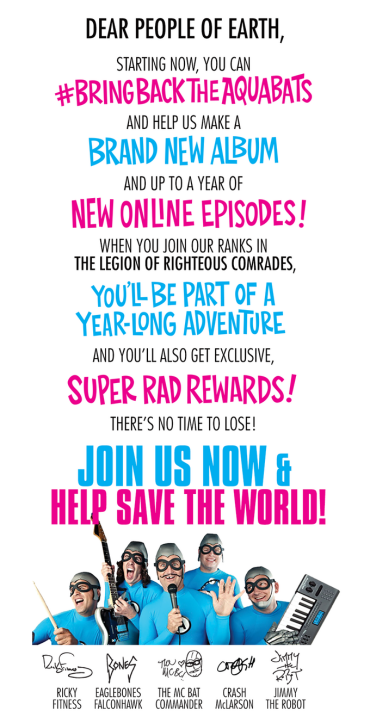 The Aquabats Super Show was the best show in the history of the world, so you should sell your house and car and send all your money to The Aquabats now!